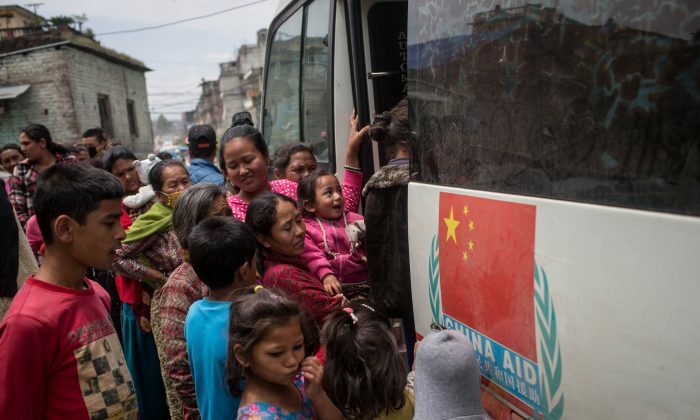 While the world’s media has been busy in the aftermath of Nepal’s earthquake recording the suffering of the Nepalese people, the rush to find survivors, and the arrival of aid, China’s state-run media has been busy hyping the care shown by the Chinese regime for the Chinese stranded there. Unfortunately, those reports are not true. The Communist mouthpiece Xinhua News agency reported that three major Chinese airlines arranged flights on April 26—the day after the quake—that would transport relief supplies and rescue teams to Nepal and then help over 1,000 passengers travel from Kathmandu to China, including 683 Chinese tourists stuck in Nepal. You will never see the 10 aircraft that they said were on their way here. In fact, Kathmandu’s airport was under strict control, and no one without a ticket was allowed to enter—compatriots without tickets would not even be allowed in, much less receive a free ride home. The Chinese military attaché in Nepal, Liu Xiaoguang, said that even those who had obtained tickets from family members in China could not board the aircraft. The first batch of Chinese returning to China through Air China and China Eastern Airlines were individuals who had held valid tickets for the day or had made the purchase on that day. On April 26, many Chinese tourists had to leave the airport and return to the city due to the high cost of airline tickets. Airline tickets regularly priced at 2,000 to 3,000 yuan (US$322 to US$483) were reportedly raised to as high as 7,000 to 10,000 yuan (US$1,128 to $1,612). According to a China Business News report, airline ticket prices from Japan to China during the Japan earthquake in 2011 had also soared. A sudden increase in demand was said to have caused the ticketing system to automatically raise the fares. Sohu.com quoted Liu Xiaoguang as saying that some airlines were profiting by raising the price to 13,000 yuan. “It’s like looting people, taking advantage of a natural disaster,” he said. This report was soon deleted from the Chinese Internet. On April 27, the Ministry of Foreign Affairs also said that there had been no instruction to provide a free airline ticket to anyone in Kathmandu with a valid Chinese passport. Chinese returning from Nepal shared their experiences through Chinese social media such as Weibo and WeChat. a Chinese television host and Congress deputy questioned and criticized state-run TV programs about the factuality of their ratings. The magnitude 7.9 earthquake that hit Nepal hit just before noon, local time, on Saturday around 48 miles north west of Kathmandu. Chemist who makes synthetic drugs questions why someone would want the dangerous substances.